Auras were occasionally surprisingly good, even long before the totem armor and bestow keywords. Armadillo Cloak has Pro Tour pedigree - it propelled Rith the Awakener to ridiculous airborne attacks back in 2000, and still turns any creature into a must-answer threat. And it has some of the coolest flavor of any aura, of any time. How often do you get to defeat an opponent via the concept of your creature rolling over the opposition like the armadillos in Donkey Kong Country? It works indeed. 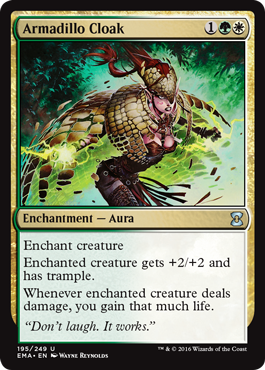 If you can drop this on a creature of any meaningful size and swing even once without eating a removal spell, the resultant life swing can turn a game around. Auras from The Good Old Days didn't usually make headlines, since their baked-in card disadvantage was just too... disadvantageous, but this effect was worth opening up the possibility of getting 2-for-1'd. In Limited, it's an "answer me now or lose" card, and in Constructed, it can break open stalemates. Sure, sometimes your opponent had the answer in hand, but you can't live in fear of what your opponent may or may not have. If you don't press the attack, then that's even worse than having your spells countered because they didn't have to expend resources to stop you. lackluster enchantment, though it's at least reasonably costed. one thing that is curious about it is it doesn't say "creature gains lifelink". weird.